...I commissioned artwork to commemorate our battle with Churlydtyrch! The ink is still wet, but the Fraim Bros. sent me a scan of the completed artwork. 11x17 and a mere $100! After several minutes of walking, sometimes crouching, the party entered a brightly lit chamber. The floor was polished marble, the walls frescoed. Granite pillars ascended to the ceiling that was lit by an enormous crystal chandelier. Potted trees and verdant plants were arrayed on the edges of the room, small birds flittering back and forth. In the center of the room was a vast pool of indeterminable depth. The violet water was still and glass-like. In front of the pool was a carved stone fountain of a maiden pouring clean water from an urn and tables of sweetmeats, fruits and all manner of delicacies was arrayed on either side of the fountain. Devin was delighted at this improbably Eden and he rushed forward to sample a large cream and berry trifle, dripping with honey and brandy. It was heavenly in his mouth. Kevika took a drink from the fountain, the water was both refreshing and cleansing. Marek happened to glimpse a pair of stone archways on the eastern wall and he began walking towards them to see what treasures he might find within. Titan was the first to notice the ripples in the violet water. They were small and mesmerizing, seeming to dance across the surface. Soon a few small bubbles rose up from below, gently bursting when they reached the air. It was then that he began to feel an immense sense of dread, knowing that something was very, very wrong. A vast pale leviathan burst up from the pool and the party stood transfixed by the sight. Devin thought it to be a whale or some other creature of the deep, but he knew it to be instantly malevolent and vile. The beast had three crimson orbs in a vertical row above a vast mouth filled with clear white dagger-like teeth. Two huge tentacles pulsated from the sides of the beast, stirring up a billowy cloud of mucus all around the beast. Two lesser tentacles framed the mouth, slavering hungrily about the maw. The paradise around the party faded from view, revealing it’s true nature as a dank cavern and Devin saw with disgust that he had taken a bite of an animal carcass. Kevika likewise had drank from a stone cistern filled with brackish water and she gagged. Her knees buckled for a moment and she stood trembling for she knew that the party faced a horror of the dark sea depths, an Aboleth. A deep, primordial voice penetrated everyone’s thoughts. It was piercing and painful to hear, and the thought could not be shut out. 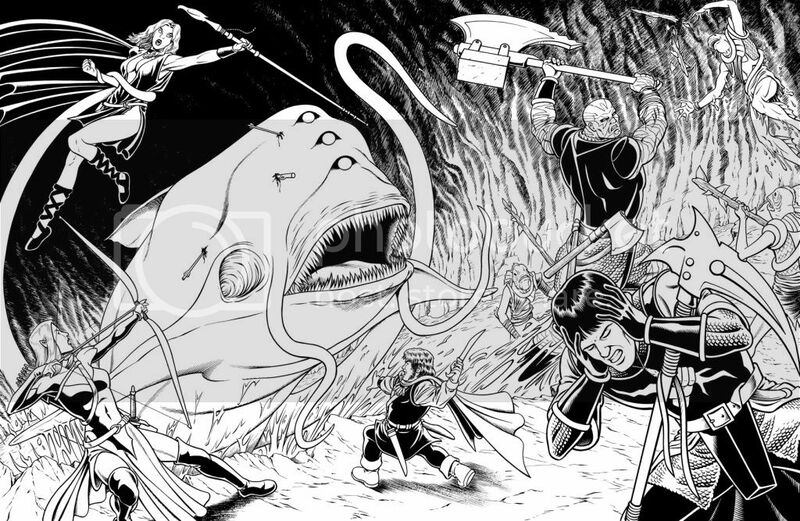 As the voice echoed throughout their thoughts, the party could feel the Aboleth searching their minds, extracting information at will and weakening their resolve. A terrible guttural laugh seemed to roll around the chamber like a thunderclap as Churlydtyrch squirmed about the massive cloud of mucus, delighting in the folly of the surface dwellers. With that, the Aboleth began his attack, seeking to dominate the party, bending them to his overpowering will. The thought of becoming a thrall was more than Devin could bear and fear alone broke the mental link that bound him to Churlydtyrch. With a shout born of anguish and instinct, he hurled both daggers at the aboleth, their enchanted blades sinking deep into the soft flesh. Churlydtyrch had not felt pain for years and the sudden sharp sensation caused him to flinch, his bloated body quivering. His attention was diverted for just an instant, but it was long enough for the rest of the party to break free of his hold and they brought their weapons to bear, just as four fish-like humanoids known as Skum emerged from the pool, reaching out with webbed claws. The Aboleth sought to dominate Kevika first, sensing that her mind would be the most difficult to penetrate. Tentacles flailed and Kevika dazed by the attack, permitting two of the Skum to attack her. One hurled a blob of blinding mucus at her while the other raked her flesh with a scaly claw. Titan tried to advance on the behemoth, but he was caught up in the swirling cloud of mucus that clung to his legs and slowed his progress. The Skum flanked him, drawing a bloody mark across his back with their claws and grappling him. Kayleth, horrified, did what she does best and stayed back with Devin to attack from afar, offering support to her allies and trying to weaken the foe. Marek could feel Harvester calling him. He looked down at the scythe and found comfort. He felt compelled to investigate the archways, hoping for some way to gain advantage over Churlydtyrch. Inside one alcove was set a great treasure hoard, the accumulation of what the Aboleth’s charmed servants had been able to amass. In the other, three massive jelly-like eggs, each larger than Marek, lay encased in a shroud of mucus. He could see some perverted spawn wriggling inside and Harvester compelled him to attack, hacking at the eggs with an unnatural fury. The Aboleth knew immediately that his brood was in danger and he telepathically ordered the Skum to stop Marek at all costs. Titan was able to prevent two from advancing against Marek, stopping their run with a great stroke of his axe in a spray of blood and scales. Enraged, the Aboleth stretched out his will and Marek’s mind was nearly annihilated. The psychological components of the human mind could not fathom the tug of war that raged within as Churlydtyrch and Harvester fought for sole control of Marek’s conscious mind. His subconscious, tasked with self-preservation and self-gratification, completely shut down and Marek’s eyes rolled back in his head. Two of the three eggs were destroyed, the soupy brine surrounding the larvae was all about him and he fell to the ground, writhing and convulsing as his mind was ripped apart. Blood trickled from his nose and ears and he was seconds from death. Acknowledging that Marek was about to die, Harvester relented and allowed the Aboleth to take control of Marek. But Harvester did not abandon him. The tainted scythe was planning a counterattack, when Marek had recovered enough to be able to fight off the Aboleth’s mental intrusion. Marek strode out of the egg chamber, covered in slime and mucus, his pupils dilated and his body under the Aboleth’s control. He called down a lance of faith, targeting Titan, but Harvester chose that moment to attempt to seize control again. The divine spell was miscast, missing the goliath and Harvester urged Marek to expel the Aboleth from his mind. As Marek struggled, Devin and Kayleth dispatched the Skum and turned their aggression to Churlydtyrch. As Titan hewed his axe into the Aboleth, Kevika struggled. She was constantly beset byChurlydtyrch and she fought the good fight. She was unable to get an advantage and was content to merely stand defiant against Churlydtyrch and his minions. Eventually, her resolve failed and the beast gained a foothold in her mind. Dominated, Kevika attacked Titan and he reeled from the blow. The sight of her wounding one of her companions was too much for her and she commanded Churlydtyrch to leave her thoughts. The beast reared back in the pool and flailed at her with his mighty tentacles, having lost the battle of wills. From that point on, the tide had turned. The party teamed up against the Aboleth and with a sudden rush, the albino creature flopped down on the rocks at the edge of the pool, huge bleeding rifts all along his fattened body. A great fishy tongue lolled out of his mouth and the beast slid without fanfare into the darkened water, a trail of bubbles breaking at the surface for several seconds. Exhausted, the party tended to their wounds and inspected the treasure pile, making sure they had completely destroyed all of the Churlydtyrch’s eggs. Devin spotted a small tunnel in the treasure room and crawled inside. A feminine scream was heard and Devin, blushing, came out dragging the bound ambassador’s daughter behind him. Her bonds were cut and she was relieved to have been rescued, nearly fainting from joy. Awesome story, really neat artwork. I'm particularly interested in the B&W "old school" look, and that art really is cool. The Fraim Bros do great work. I've had them do individual pencil & ink 9x12's of my favorite characters ($30) as well as group battle scenes (up to $100). They look SO cool framed in the gaming room. And they are fast! I commissioned this latest piece a week ago. It will mail tomorrow! Thanks for sharing your tale and that awesome art, Burchard! I'm delighted you enjoyed the adventure (especially enough to actually commemorate it via art)! Reading recaps such as these truly inspire an author to further their craft. Oh wow! Neat-o! Thanks for sharing!